south-eastwards for a distance of 430 metres. for 4 weeks. While the closure is in operation an alternative route will be signed on site. 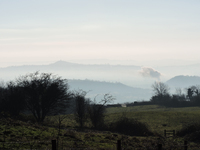 The farming and wildlife advisory group (FWAG) have sent us their useful leaflet giving guidance on slowing down water runoff from the fields around Wookey Hole. FWAG want us to install small log dams in ditches and water courses around the village. 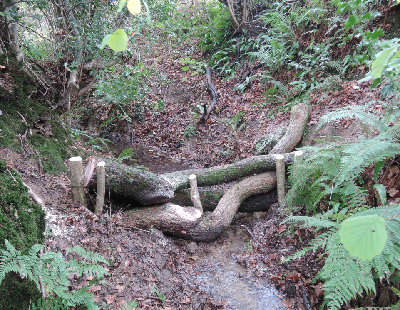 These ‘leaky’ dams slow the flow of the water into the River Axe and help prevent flash flooding further down-stream. Welcome to Wookey Hole, a small village in Somerset, on the outskirts of the beautiful City of Wells, famous for it's Cathedral. 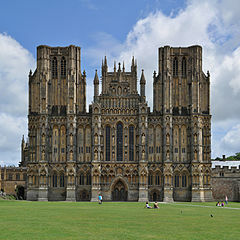 Set in the Mendip hills, with Ebbor George and the famous caves, it has a population of 450. The river Axe flows through the village from the caves, and for several hundreds years has provided clear water for several paper mills. St Cuthberts Mill currently produces the high quality artists' "Bockingford" paper. This quality is obviously not a new thing as, in the past it also made paper for bank notes! The village has a Church, a Community Hall, two hotels, a restaurant, a licenced “club”several B&B's and a holiday caravan site. Weston-Super-Mare, Bristol, Bath, Taunton, Bridgewater,and Yeovil are all within 20 miles, and the area has wonderful views with lots of walks and cycle rides. Two golf courses, the Chew and Blagdon resevoirs full of brown and rainbow trout, and the Glastonbury angling club,are available to everyone. On our doorstep is Glastonbury, Clarks Village, and the levels famous for bird watching but infamous for winter flooding! Nevertheless, a lovely habitat to explore by foot or by cycle.